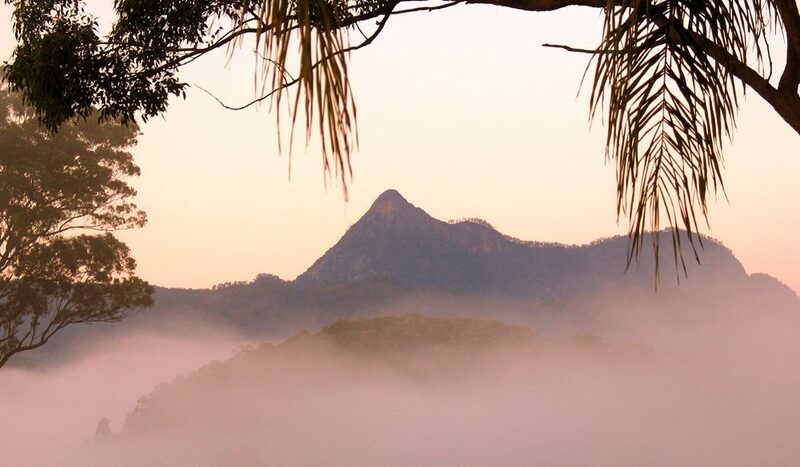 The morning mist clears over Mount Warning, Cape Byron, NSW. Cape Byron, in northern NSW, is the most easterly point on Australia’s mainland. So, if you like – and most people do – you can stand at the very eastern tip and say you’ve been there. But for a magical experience, you have some work to do: you have to climb World Heritage-listed Mount Warning (Wollumbin). This is the spot where the sun first touches continental Australia every morning. An eroded chamber of a (thankfully) extinct shield volcano, Mt Warning is considered by locals to be a top place for dawn proposals of marriage. Down the hill is, of course, magical Byron Bay. A combination of great beaches, great surf, plenty of cafes and bars, alternative therapies galore and a good music scene has made Byron a Mecca for sun and life-loving types. Captain Cook named Cape Byron after the poet Byron’s grandfather, who sailed around the world in the 1760s. Virgin Blue and Qantas fly into the nearest airports: Ballina (30 mins south of Byron Bay) and the Gold Coast Airport in Coolangatta, QLD (60 mins north of Byron Bay). With breaks, Byron Bay is about a 9-hour drive from Sydney and about 2-hour drive from Brisbane.